In 1982 Martin Hollmann held one of his aircraft design classes in Santa Monica, CA. Six people attended including Lance Neibuaer. He asked Martin if there was a future in bringing to market a new, two place sport aircraft. Martin of course said "yes." Two years later, Lance sent Martin a request to perform a stress analysis on his two place design and a check for $200. Richard Trickel offered to build the moulds for Lance's aircraft at no cost. Richard had formed a composite fabrication company called High Tech Composites in Oxnard, CA. Lance moved to Santa Paula, CA based on Martin's recommendations and rented a shop space that had been occupied by Jim Kern of Task Research. The new aircraft was powered by a Continental 0-200 and Lance called his aircraft the Lancair 200. It had a cruise speed of 200 mph. Although the prototype was made of urethane and hot wire cut styrofoam and covered with wet layed up fiberglass, the production Lancair 200 kit parts were made of temperature cured, prepreg fiberglass and graphite parts. They were lighter and stronger than the epoxy, wet layed up, fiberglass parts used on most kits at that time. Lance Neibauer sold his family home to pursue his dream of producing the perfect kit. At the time, only the prototype had flown but its performance on an O-235 engine was good. 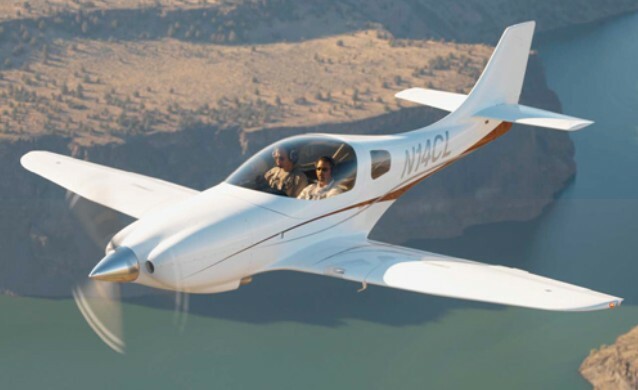 The Lancair 200 is a sleek two-place retractable with maximum level flight speed of 213 mph and 625 pound useful load, and 193 mph cruise. Comprising 27 premoulded, oven cured components, it can be put together in around 600 hours. The structural integrity of the Lancair wing is said to be +9G and -4.5G ultimate at maximum all up weight (MAUW). This is achieved with an airframe in excess of 25 per cent lighter than similar aircraft built using different construction methods. At Oshkosh 87 Lancair unveiled its new 320 model, powered by a 150 hp Lycoming O-320. This increased the cruise to 230 mph from the 235 models 210 mph. Kit prices in 1987 were $16,900 for the 235, and $18,500 for the 320. When the NEICO “fast build kit” became available early 1990, popularity resulted in a one year waiting list. Two years in the development, the kit provides all major sub-assemblies including the fu-selage ex factory with a resultant saving of up to 700 hours by the builder. In twelve years 400 kits had been sold using 108-180 hp. Two models were available in 1990; the 118hp version with a fixed pitch propeller returns a 180 knot cruise on 75 per cent power while the Lancair 320, sporting a 160 hp Lycoming and constant speed unit, has a 210 knot cruise. The kit price was $18,950 (1987), and $23,200-28,900 in 1998.A kit was also available in carbon for $34,400 in 1998.The 320 is approved for aerobatics. The 320 replaced the 235. The Lancair 360 has optional wingtip extensions that take the wing from its usual 7.2 m out to 8.3 m. The empty aircraft weighs in at 543 kg and is powered by a Lycoming IO-360-B1F engine behind an MTV-12-B/175-59d three-bladed propeller. The Australasian market is provided for by licence-built 235 and 320 kits manufactured by Avtex at Ballina on the NSW coast. The Australian company takes prospective builders step by step through the construction manual. Deposits for twenty eight Lancairs were held by the NSW company in 1990 which has the capacity to turn out one kit every ten days. Standard kits can be constructed in around 800-900 hours while the “fast build" comes together in as little as 200-300 hours. Aviation Composite Technology / ACT in the Philippines was formed in 1990 to develop the Apache I military trainer from the Lancair 320.